These baths were built, and for several years owned, by the architect Henry Hewitt Bridgman. They were lavish in style and for the first years of their existence, at least, they were profitable. 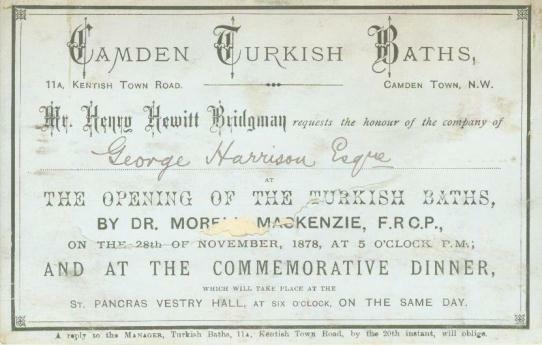 In 1881, Bridgman tried to form a limited liability company, The Turkish Baths Company Limited, to purchase the baths and build others, but the shares did not sell well and the company never went to allotment. Some time around 1911, William Cooper purchased the baths, including them in his new Savoy Turkish Baths chain. They were closed after a fire on 30 March 1916. Dr Morell Mackenzie was the first British throat specialist, often called the father of British laryngology. He founded of the first hospital in the world designed specifically for diseases of the throat, and was the author of the first standard textbook on the subject. Nothing is so far known about (this) George Harrison.